Benito is back! This time with The Benito Gonzalez Trio and we can’t wait! Join us on March 29th at 7 pm. Presenting the first in a series of “Forgotten Musicals” — the comedy, Olympus On My Mind. The show is directed by John DiFirdinando in his Lyceum directorial debut! Purchase your ticket just here. Talkin Jazz! Speakin Jazz! Real Jazz! Bernard Samuel piano, Tyrone Brown bass, Lucky Thompson drums. 432 High Street, Burlington N.J. 08016. Bernard Samuel is a Philadelphia-based pianist with a "personal touch." He began playing while attending college, and has at it ever since. Drawing from the influences of R&B vocal groups like The Harptones and The Temptations, as well as the lyrical musical styling’s of great Jazz pianists, the likes of Hank Jones, Red Garland, Tommy Flanagan and Kenny Barron. Bernard Samuel mixes all of these influences to forge a style that's all of his own. Samuel has performed with such great artists as; Hank Mobley, Little Jimmy Oliver, Philly Joe Jones, Cecil Payne, Carl and Earl Grubbs, Roy Brooks, Jimmy Merritt, Tyrone Brown, Bootsie Barnes, George V. Johnson Jr., and Johnny Lytle. Mr. Samuel currently performs nightly at various hotels, restaurants and Jazz clubs throughout the Mid Atlantic region. This South Philly percussionist has been playing drums since the age of 8, when he played at churches and special engagements. In the 1970s, Lucky began traveling and making TV appearances with his group, The Current Survivors. Since that time, he has toured in Europe, Asia, and the Caribbean, as well as collaborated with Patti LaBelle, Billy Paul, Nina Simone, Sonny Stitt, Val Ray and Big Momma Thorton. Since 1997, Lucky has served as the Musical Director of Natalie’s Lounge, at 40th & Market, where the likes of jazz greats Hank Mobley, Mickey Roker, Shirley Scott, Sam Reed, Grover Washington, Jr., Tony Williams, and even a young John Coltrane have performed. Aside from playing in clubs, and performing at festivals and concerts, Lucky is equally comfortable in the classrooms at University of Pennsylvania where he is a visiting resident, teaching jazz, percussions, and improvisations. This dynamic drummer can be heard on CDs with Umar Raheem, the Arpeggio Ensemble, Denise King, Val-Ray, and as bandleader on PTME’s next release, Lucky Thompson’s DNA. George was privileged to make his recording debut with the legendary Pharoah Sanders on the LP "Rejoice" in 1981 featuring original lyrics to John Coltrane's Classic Moments Notice. Since retiring from New Jersey Transit Rail as a train conductor several years ago Johnson's career is on the move. Washington City Paper 2016 Best Vocalist of the Year. His recent tours and performances include 2017 Detroit Jazz Festival "Hank's Symphony", Steinway Jazz Cafe * Chicago Jazz Showcase, Denmark, Israel, Parma Italy, Atlanta, North Carolina, Virginia, New Jersey, Jazz Mobile New York, Philadelphia, Montenegro with Madeinnyintl Jazz All-Stars performance for President Filip Vujanovic, Charlie Parker Celebration * Blue Room American Jazz Museum and the DC Jazz Festival at the National Gallery of the Art Sculpture Gardens entertaining more than 16,000 fans. He has produced "MONK" starring 5 time Adelco Award winning Actor Rome Neal @ Blair Mansions, Black Angels Over Tuskegee by Layon Gray @ Navy Memorial Museum, TUNISIA by Smokey Stevens and more.. In 2003, George V Johnson Jr. was commissioned by Don Sickler of Second Floor Music to pen lyrics to the music of jazz legend and saxophonist, Hank Mobley. Since taking on the project Johnson has skillfully, completed over 40 of Mobley’s classic compositions and still counting. Some with complete solo’s. Critics are already saying this is one of the most important and extensive projects to be presented to the public from the jazz vocalese realm in many, many years. With Jazz Vocalese, still in a state of infancy. GEORGE V JOHNSON JR., whose marvelous lyrics and viocal work are truly auspicous! He sngs with James Moody on ocassion and is happily remindflul of the insistent giftness of the late EDDIE JEFFERSON. Johnson’s three stanzars close with ”Relax dig the sounds of Coltrane’s Music. Coltrane fills your heart with love and harmony. Trane played with magic. Listen to the melodies and you will see momently. When you here the message of his song!”. There’s no doubt in my mind that henceforth George V Johnson should and will be sought for his own gift to the music. He sang the song for Sanders at the Village Vanguard, and Sanders “felt that George ought to be heard”. NEA Jazz Master Benny Golson on the Artistry of George V Johnson Jr.
Famed abstract expressionist painter Mark Rothko asks his young assistant, Ken, the loaded questions: What is Art? And, who gets to decide anyway? It's 1958, and Rothko has just been offered the biggest commission in the history of modern art. He and Ken work feverishly in his New York studio -- until Ken begins to realize his answers to those fundamental questions about art are very different than his mentor's. Tickets are $40.00 and can be purchased just here. The Feb 8th show coincides with the opening of Jim Watt’s art exhibit — Oil & Water — See art exhibits page for more details on Mr. Watt’s show. We will have a brief “Meet & Greet” followed by RED with an after party reception in our gallery at the end of the performance. Join us! Lyceum Hall Center for the Arts is producing a cabaret fundraiser to support Lyceum Studio’s arts education programming. Broadway’s Renee Chambers Liciaga is our MC for the evening and also one of our special guest performing artists. We’ll also be introducing our Musical Theatre Competition Troupe! Plus, all of our theatre, dance, and instrumental teachers who will all perform for you! Come out to our theatre on December 7th at 8 pm to enjoy singing and dancing by professionals and locals! This event is a BYO but we will have refreshments on hand to add to the festivities. Our first market was a resounding success and we are even bigger this year! As before, the market is filled with juried handmade crafts. This year we have added some surprises including a Kids’ Corner where for a small fee your kids can get crafty while you shop! Come out to shop for the holidays in our beautifully renovated historic Lyceum Hall Center for the Arts. Our favorite guitarist, Bill Corvino, will be here for your listening pleasure! THERE IS STILL SOME ROOM FOR VENDORS. PLEASE CONTACT DAWN AT LYCEUMHALLINFO@GMAIL.COM FOR AN APPLICATION AND FURTHER INFORMATION. If you are an artist who is struggling to make a living or an artist who is doing well but wants to be even more successful, this is the seminar for you! Join us on Wednesday, October 10th at 7 pm for this event with artist Gwenn Seemel. Gwenn Seemel has been doing just that and is happy to share just how it's done! Recipient of multiple grants, from Artists’ Fellowship Inc and the Haven Foundation among other institutions, Gwenn's work has been written about by the art historian Richard Brilliant and featured widely across the Web, including on sites like Scientific American, BoingBoing, and Hyperallergic. In 2014, she created the Kirk Reeves memorial mural in Portland. Gwenn has given TED Talks in Geneva and elsewhere and we are happy and proud to host her here at Lyceum Hall Center for the Arts. Workshop cost: $20.00 Please make check payable to The City of Burlington. Embroidery is a truly lovely craft. Become acquainted with this needlework tradition that dates back to the 5th Century BC. Master Teacher, Ylvia Asal, will teach the basic stitches along with some "fancy" stitches including the French Knot and Lazy Daisy. Use your newfound crafting skills to make jewelry or embroider your clothing in the style of Alabama Chainin'. ***This workshop is presented in collaboration with The Burlington County Historical Society and will be held at the Corson-Poly Center. Please use the visitor entrances at either 457 High Street at 454 Lawrence Street. Interested in experiencing the mystery and sensuous beauty of age-old performance art? Come on over to Lyceum Hall Center for the Arts and teacher, Via, will guide us in this class designed for beginners or for those wishing to brush up basic techniques. Students will learn shoulder and hip shimmies, hip drops and lifts, snake hips, rib circles, and rib drops. We are excited to announce this fun event! Please join us for an unforgettable performance by some of your local favorites. Enjoy many beloved songs from Wicked, A Chorus Line, Annie Get Your Gun, Into The Woods, Sweeney Todd, and more! This benefit puts a twist on male and female character songs. It's a lot of fun! *All proceeds go toward programs and classes at Lyceum hall Center for the Arts. There is a materials fee of $7.00 (cash). Come learn this century-old technique! Artist/Designer Ylvia Asal will teach the basic crochet stitches so you can create lace projects including earrings and scarves. AS OF MAY 16, 2018, THIS EVENT HAS BEEN POSTPONED! PLEASE LOOK FOR TICKET REFUNDS WITHIN ONE WEEK OF THIS ANNOUNCEMENT. Jennie Marino, who has worked on 45+ Broadway productions, Off-Broadway, and Television, will present a two-hour storied show & tell lecture and workshop at Lyceum Hall Center for the Arts on May 20th from 1 pm – 3 pm. Using various props and pieces to demo and pass around, Ms. Marino will share tips and tricks for every level of props and SFX theatre production from community and regional to professional theatres. Part of this lecture will include a half hour demo doing a lifecasting on one of the lucky attendees. Q&A session follows. This workshop is a must if you want to hone your craft and meet your design budget while creating extraordinary props and special effects. Tickets available online at TheLyceumHall.com. The cost for the workshop is $30. There are limited student tickets available for $10. Ticket link is below. Jennie Marino is a multi-disciplined artist with extensive knowledge of materials and techniques. Jennie has worked on such shows as Phantom of the Opera, The Producers, The Lion King, Beauty and The Beast, Miss Saigon, and more. Among her many expert skills, Ms. Marino boasts puppet making, life casting, sculpting, prosthetics, and masks. With 30 years of production experience under her belt, Ms. Marino has a wealth of information to share. You don’t want to miss this opportunity to “connect with the best”. February is chock-full of celebratory events and historical information. From a jazz concert to a film screening and an exhibit of panels explaining the role of African Americans in the Revolutionary War, we've got something for all ages and interests. "Hometown Jazz: An Evening of Jazz by Young Artists"
Film Screening: "Our Side: Growing Up in the Other Atlantic City"
OH, Freedom! African Americans in the Revolution. The show is curated with only hand-crafted items. A perfect time to shop locally and support the arts in Burlington City! David May & Friends -- A Family Holiday Concert on December 3rd! Please join us at Lyceum Hall Center for the Arts for this fun family-friendly holiday concert on December 3rd, 1:00 PM - 2:30 PM. Tickets are $20 for adults; kids 12 and under are free. This is a benefit concert for Burlington City High School music program and Lyceum Hall Center for the Arts classes. Get ready for an auditory experience that has to be seen to be believed: a musical instrument that plays without being physically touched. That’s the Theremin, an electronic musical instrument sounded by the performer gesturing in the air to control radio frequencies, and it will be onstage front and center Saturday, October 21, 2017 at 7:00 p.m., when Mano Divina & The Divine Hand Ensemble perform at Lyceum Hall Theatre, 432 High Street in Burlington. The concert is presented by Arts Guild New Jersey in collaboration with Lyceum Hall Center for the Arts. Tickets are $18 advance, $22 at the door and available online through Eventbrite. The Theremin is named after its inventor Léon Theremin, who created the device in the 1920s. Originally conceived as an orchestral instrument, the Theremin’s wavering, eerily haunting sounds quickly became a staple of sci-fi and horror movie soundtracks. The 9-piece Divine Hand Ensemble of Philadelphia has brought the Theremin into the mainstream of 21st-century music and features a string quartet, two harpists, two vocalists, a guitarist and Mr. Mano Divina, virtuoso of the Theremin. Divina, a former rock and jazz drummer with Flag of Democracy and Sun Ra, mastered the instrument’s sonic subtleties and sought to revive the Theremin’s concert legacy with a lively fusion of rock, classical and film music, from Mozart, Queen and Zappa to Harry Potter and Ghostbusters. Mano Divina & The Divine Hand Ensemble is an ADA accessible event. For more concert information contact: artsguildnewjersey@gmail.com. Come learn classic and Latin-inspired Ballroom dancing -- FoxTrot, Waltz, Rumba, and Hustle! Classes are held on Friday evenings from 7-8 PM. Hate Mail is an epistolary play something like Love Letters, with two actors reading letters and other correspondence, but it's a little wilder and more hysterically funny. It tells the story of Preston, a spoiled rich kid who meets his match in Dahlia, an angst-filled artist. Their worlds collide when Preston sends a complaint letter that gets Dahlia fired from her job, and then there's no turning back. The play stays with their increasingly crazed correspondence as they move from hate to love, and then right back again. Pictured here: "Mermaid Warrior", a necklace of polymer clay and beads. How To Submit So Your Plays Get Produced: a workshop talking about best practices in sharing your work, networking, record keeping, and more will be presented by Lyceum Hall Center for the Arts on Sunday, June 11 from 11 AM to 1 PM. The seminar is free. Lyceum Hall is located at 432 High St, Burlington City, NJ. This workshop is designed to inspire writers to market their work more effectively. You hear it all the time: the only difference between unproduced playwrights and produced playwrights is that produced playwrights get their work seen by the decision makers. That translates to submissions and networking, a daunting task we'd like to simplify. This workshop covers resources for finding opportunities, tips for easier submission, success stories from cold calls, and remote networking. After Stephen’s presentation of this workshop at the DG National Conference in La Jolla, and at DG events in Ohio, Atlanta, Pittsburgh, and Baltimore, we are so excited to finally have a chance to offer it here in Burlington City. The event is free of charge and is open to both DG members and non-members. Feel free to bring a friend who you feel may benefit from membership in the Dramatists Guild. Please note: Bring a laptop or notebook or pad of paper and get ready to jump into summer with a newfound confidence in sharing your work. Guerilla Haiku Movement Comes to Burlington! Did you ever write a haiku? Have you ever thought how haiku poetry could create community? Caley Vickerman, Haiku Mistress from the Guerilla Haiku Movement explains the power of community haiku. In this era of hyperstimulation - people are feeling increasingly isolated, even in the places (cities, neighborhood, communities) where we are supposed to feel connected. Guerilla Haiku uses haiku poetry as a tool (simple, elegant, structured and precise) to empower residents of a neighborhood to reconnect with the spaces around them, the strangers they pass every day and, inevitably themselves. Haiku, because of their brief structure (3 lines with 5 syllables in the 1st line, 7 in the 2nd, 5 in the 3rd) empower people to share stories and surprise participants with their own ability to engage in creative play. The result is a group of people reinvigorated by these new connections to invest more deeply in the communities in which they live and move. Powerful words that emphasize the importance of connection. And in this case, connection through haiku. Caley will begin with begin her day in Burlington City at Lyceum Hall Center for the Arts, 432 High Street where she will meet with teens and adults, including City Council members and police officers, who form her Haiku Scavenging Team. After an instructional meeting, the team will hit the streets. We’ll break for lunch/snacks at 2 PM (bring a bagged lunch with your name on it!). Then, a 3 PM talkback is scheduled with Caley and open for anyone who would like to learn more about this community building project. Caley will install a temporary art exhibit using the haiku gathered earlier in the day. This exhibit is open to the public On June 3rd at 3pm and again June 6th through June 16th weekdays only from 11 AM until 2 PM. Have a few hours? From 11am-2pm Join a haiku scavenging team to gather haiku by starting conversations in the neighborhood around the Lyceum. Then share your experiences with other participants. Have an hour? At 3pm Enjoy a talkback about the Guerilla Haiku experience at the Lyceum led by Caley Vickerman, founder of Guerilla Haiku and hear highlights from the participants. Have a few minutes? Stop by the Lyceum at any time from 11am-2pm to leave behind a 17-syllable haiku sharing YOUR story. You can leave your haiku in a basket on the table in the hallway. 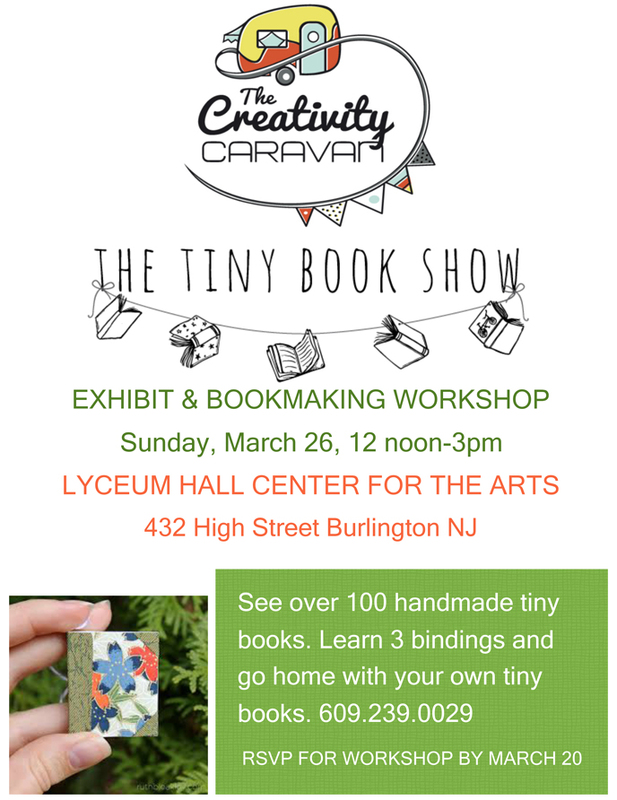 We welcome Amy Tingle and Maya Stein from The Creativity Caravan who will share their collection of over 100 tiny handmade books. amy and Maya will also offer a three-hour bookmaking workshop. come on out to this free exhibit and workshop to view the collection, learn three binding styles, and take home your own tiny books. The Burlington Piano Slam! 2017 is a six-concert jazz piano series featuring internationally acclaimed pianists. The series is produced in partnership with the Peabody award-winning Luce Group under the direction of James and Genevieve Luce. PLEASE JOIN US ON JUNE 10 at 7:30pm TO HELP US WELCOME FRANCESCA TANKSLEY TO OUR THEATER! Francesca Tanksley, internationally-acclaimed jazz pianist and composer. Francesca has been a featured artist on Marian McPartland’s widely acclaimed NPR series, Piano Jazz. We welcome local modern artist, Alex Carlbon, to our exhibit room for the month of February. Alex paints on old doors and shutters, luan, and canvas. The bold works are at once energizing and hypnotic. Pieces are available for sale. A convention for seasoned and aspiring artists celebrating the creative process and the mentor-ship of a new generation. A unique and intimate engagement featuring workshops, educational symposiums, portfolio reviews, demonstrations, and displays from featured artists, illustrators, sculptors and writers; all willing to share their expertise with those looking to build and expand professional bridges or pursue a career in the Arts. This special event is coming to the Lyceum Hall located in the historic City of Burlington, NJ on September 17 & 18. For details, and information on attending this one-of-a-kind event, visit artistacon.org. New artists, guests, and symposiums added weekly contact us today! What to do, what to do? Your picture doesn’t look quite right to you. Your picture is just little off and with incredulity you scoff. What could this grand dilemma be, why it’s most likely composition you see! Join designer and artist Mark Collins and learn the principles and elements of design. The principles of design are the laws for designing anything and the elements of design are the tools that are used to make a great composition. Learn how to analyze why a composition works and how to fix a weak composition when it doesn't.. These concepts will teach you how to make the great composition every time. Click here to download the supply list, Mark's biography, weekly class outline, registration, and payment forms (pdf). Hear Ye, Hear Ye! Learn for thyself painting techniques of yore. Opulent skills that have stood the test of time and the rigors of antiquity and modernity. Using your own daguerreotype (photograph) for subject matter, learn to paint in layers using a triadic color palette and a monochromatic underpainting, while incorporating staining and glazing techniques. The basics of color theory and the different types of acrylic paints will be discussed. Turn your artwork upside down and inside out. Use a dab of this and a dab of that, you’re fearless and it shows in your art. Conjure up your creative courage and learn to use opaque watercolor (gouache) as an underpainting with bold applications of pastels on top to create paintings loaded with color and vitality and explore endless possibilities.